Albert Einstein once went to school in Aarau in Switzerland. Nowadays there is a restaurant named EINSTEIN. It is a really nice place with café, bar and restaurant. 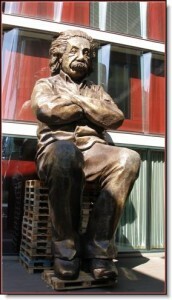 There was a big plastic statue of Albert E outside, probably only temporary. Compare the size with the house behind the statue, his head is at the second floor. Posted on October 26, 2007 by BengtPosted in Bits and piecesTagged Photo, Travel.